In the Augustiner Festhalle, like in the other tents, you can reserve tables for a given day and time so when I arrived for the 10 am opening I found a white sign on most tables listing a name and a time. So, I took a table that wasn't booked until 17:00, giving me plenty of time to enjoy some beer and food. 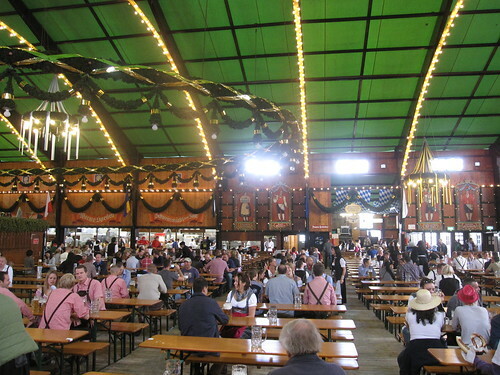 Even on a Monday and with a seating capacity of 6,000 the Augustiner Festhalle filled up completely in just two hours, and I mean completely. Every bench at every table was full (I was joined by a group from Munich) and by noon a lot of people had to stand, waiting for their reservation to kick in or for someone to leave. This photo was taken at 10:11, just as people started to arrive.